Hutchison Vale Colts Under-15s travelled to Fernieside as they took on Edinburgh South in the John McConnell Memorial Cup. The visitors emerged from the clash as 3-1 victors, but their lower-league opponents put up a good fight. Winds swept across the pitch, adding an extra layer of difficulty for both teams as the ball swirled about in the air. Hutchie came close twice in the opening ten minutes from corner kicks, but both efforts went wide of the upright. In the 26th minute Zachary Teegarden played Aiden Hart through on goal but Edinburgh keeper, Sam Hunter, made a brilliant save at point-blank range to deny Hutchie their first of the day. Just as it looked as if both teams would finish off the half level, Cole Johnston got on the end of a cross from the right and with a composed finish slotted into the net. At the half-way point Hutchie had created more goal scoring opportunities, but were often found wanting as Hunter was in tremendous form between the sticks for Edinburgh. Edinburgh equalised soon after the restart from a corner. The ball was flicked on towards goal by half-time substitute Daniel Thomson and prodded over the line by Daniel Lynch. Keith Kitching put Hutchie back in front with a low blast from inside the box. Sam Coats scored late in the game to seal their progression to the fifth round. A terrific first-half performance from Leith Athletic Under-13s stunned Currie Star Blues in the Ken Ritchie Cup. Shay Purves opened the scoring for Leith with an impressive curling shot that found the top left corner. The second goal of the game came from Callum Howie, who put in a man-of-the-match performance in the centre of the park. After a powerful run from deep within midfield, he unleashed a left-footed shot past the helpless opposing keeper. The third came from a corner which was swung into the box from the right by Ray Ramsay. The ball was headed back towards him before he whipped it over the keeper and into the opposite corner. Both teams battled hard in the second half, but with no further additions to the score, a 3-0 win, means Leith progress to the fifth round of the competition. 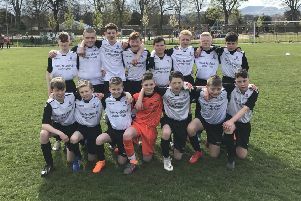 • Lasswade Thistle Rose Under-14s have advanced to their first-ever cup final after edging past Spartans Locomotive 1-0 in the semi-final of the Charles Kilvin Cup. The game was a tough yet sporting encounter involving two teams at the top of their game. The first half was largely even as they battled it out for superiority. Spartans had slightly better chances in the second half but could not finish them off. Lasswade showed their tenacity and resilience with a late winner from Marcus Main. • Penalties were needed to decide a winner in the Division 3 League Cup match between Arniston Rangers Blues Under-16s and Redpath Albion. In regular time the match was a very even affair with chances on goal for both teams at a premium. Redpath took the lead but Craig Hodge levelled for Arniston, taking the score to 1-1 at full time. With no score in extra time, penalties followed. Bryce Thomson, Stuart Kilshaw, Craig Hodge and Matthew Hutton all converted to give Arniston the win.